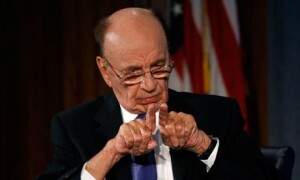 News Corp Chairman and Chief Executive Rupert Murdoch has issued his most forthright tweet since he activated his Twitter account on January 1st by accusing Internet giant Google of aiding film piracy. “Piracy leader is Google who streams movies free, sells advts [advertisements] around them,” Murdoch wrote, adding later that film making was “risky as hell”, with piracy hurting actors and writers. Although he described Google as a “great company doing many exciting things” he had “Only one complaint, and it’s important,” he tweeted. He made his comments in response to the Obama administration’s stance against two anti-piracy bills that Hollywood is backing, following the publication of a blog from three senior Obama officials. “So Obama has thrown in his lot with Silicon Valley paymasters who threaten all software creators with piracy, plain thievery,” Murdoch tweeted.